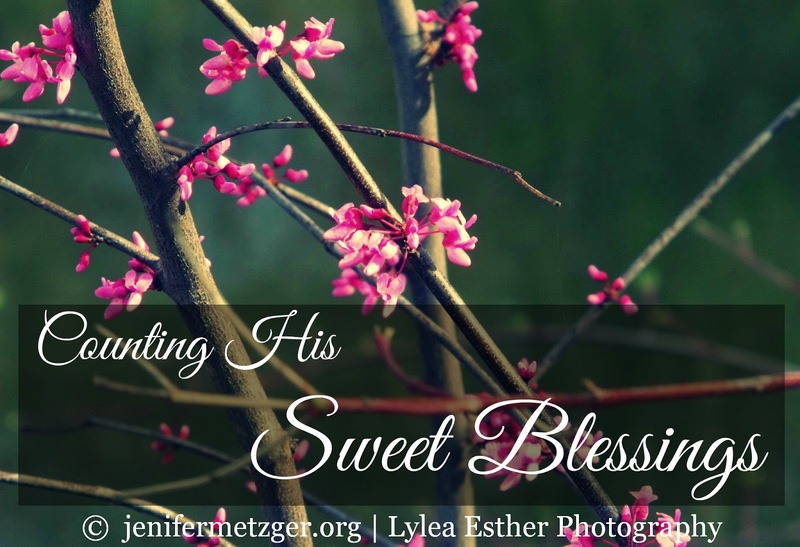 Jenifer Metzger : Should I Continue To Count My Blessings? Should I Continue To Count My Blessings? Today at Woman to Woman Ministries, we are continuing with our series titled Fruits of the Spirit in Marriage. Today's fruit us faithfulness. Join the conversation HERE. Several years ago I accept a challenge from the precious Ann Voskamp at A Holy Experience. Ann challenged us to count our blessings. Each Monday she posted her own blessings on her blog and called it Multitudes on Monday. I loved this idea of counting my blessings and I really loved the idea of being intentional and dedicating a day of the week to focus on thanksgiving. So I began to count my blessings. Every Monday I would come to this blog world and think back over the week on how God has blessed me. This practice has become a blessing in itself. One year I had gotten close to 1000 blessings. Then with the new year, I started over and have continued to count to where I am now over 1500 blessings. Blessings in everything. The big things, the little whispers of God, everything. His sweet blessings. But lately, I have felt more like I was going through the motions, than really praising God. I don't want that. I have been considering giving up on the whole thing. God is so good. He blesses us continually. We need to praise His holy name. We need to intentionally thank Him for His wonderful works in our life. There is a saying that goes, "what if we woke up tomorrow with only the things we thanked God for today?" Counting our blessings is not bragging. It is not boring. It is not a bad thing. We need to praise God, He is worthy of praise. We need to thank Him. We need to hear others thank Him. I love hearing others praise God for His goodness. I've decided to continue counting my sweet blessings. Continue to praise God for all He has done. And I want to do it with a heart of gratitude, not out of routine. I want to rejoice in His goodness. I am going to renew my commitment to count my blessings and I am so excited about it! I want to challenge you to continue counting your blessings with me. Each Monday leave a comment with how God has blessed you this past week. Let's rejoice together! 1559. A relaxing week off from the regular busyness we have had. 1560. My husband's hard work over the weekend to get our church office remodel finished and everything moved in. 1561. A new baptism and salvation at church. Praise! 1563. My son's end of season baseball party and watching him get his trophy. 1564. Clouds. I love clouds! 1565. Early morning time alone with my Daddy God. I, too, used to 'count my blessings' but gave up doing it because I felt I was going through the motions! I also felt like I was repeating myself too often. Many times I've regretted giving them up. Maybe I should start again!